Hometown: I go back and forth weekly between New York City & Sharon Springs, NY. 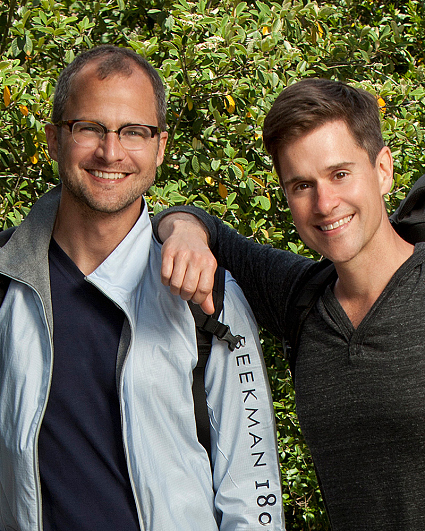 Previously appeared on their own television series: “The Fabulous Beekman Boys” aired on Planet Green (Discovery) for two seasons (cancelled in 2011). Describe what you do: During the week, I work as an Advertising Creative Director in New York City. On the weekends, I commute to my goat farm in Sharon Springs, NY. 3 words to describe you: Funny, self-deprecating and generous. Favorite hobbies: Cooking, gardening and traveling. What is the accomplishment you are most proud of? Reviving the small town where our farm is located by bringing attention to Beekman Farm and rural America through our television show. What scares you most about traveling? Falling ill during The Race. What excites you most about traveling? Partaking in new cuisines. Biggest challenge you and your teammate will face on The Race together: We are quick to argue and both of us think we are the smartest people in the room. Pet peeve about your teammate: Brent never admits when he is wrong. What country and place would you most like to visit and why? There are two: Italy, because I can’t believe I have never been, and Russia because of the history and culture. What do you hope to accomplish by running The Race (other than winning one million bucks)? If we win, we could finally be together under the same roof every night for the first time in three years. Being apart during the workweek has been a struggle and gone on far too long. Current occupation: Chief Executive Officer of Beekman 1802. Describe what you do: I manage our 60 acre goat farm and run our company, Beekman 1802. 3 words to describe you: Focused, ambitious and open-minded. Favorite hobbies: Working in my garden, organizing community events and meeting new people. What is the accomplishment you are most proud of? Working with our small farm community to bring in new business and gather attention for rural America. What scares you most about traveling? Being unable to resolve a situation because of a language barrier. What excites you most about traveling? Seeing things I have never seen before and probably will never see again. Biggest challenge you and your teammate will face on The Race together: Communication and the fact we both think we are always in the right. Pet peeve about your teammate: He is too nice. He can’t always be nice and expect to get ahead when everyone else is playing dirty. What country and place would you most like to visit and why? Asia and the Middle East since I want to know more about these cultures. What do you hope to accomplish by running The Race (other than winning one million bucks)? As I get older, I realize life is about making memories and this will be an experience we both will never forget.